Brandi ~ Not sure if you access other websites for graphics. Found this one and it has quite a bit. 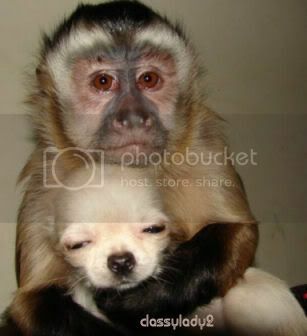 Also here are a few pics I found, maybe another Monkey would like one of them. Sorry for loading up the site, but I couldn't pass these up...they are all so cute. ANJM: my husband wanted me to put firecrackers under your um ...bottom Wink ------> I say go for it and you can even do a bow and make her a girl. I do so want to see those firecrackers/fireworks ! Thank you for all the cute costumes you make for us!!!!!!!! Sorry it took me so long to answer. I have been sick today and stayed in bed. I got up for a few minutes to check out the thread. I love the avatars and can't thank you enough for your special attention! You're very talented and your work is absolutely beautiful. I had funs with yours, I am happy you like them! Hi Brandi, I know you would never blow up SweetMorgan, that's just not who you are! Thank you so much for giving her a new up to date outfit. We are so very patriotic that we just had to go with the flag. I don't post much as I am a super sensitive person and am afraid I might offend someone but I read here all the time. You make me feel like a real monkey anyway. I love looking at all your art work. Thank you, again. Glad you are pleased with the results! Thanks Brandi. Digger sends you big doxie kisses. Joseff in his polka outfit is one of the funniest things I've seen. You are a very special monkey.You put so much time into what you do for all of us.It is very much appreciated. Yeah, Josef is a hoot, huh? Brandi ~ I love all the avi's! Everyone looks great! You've been really busy! I don't know where you find the time to do all this work - but I appreciate it! I love the drive in. That is really creative. I saved all of mine and I'll switch through them over the next few months. Brandi ~ I will let you chose the 4th decor for this Old Grama Monkey. I was sick today and never got out of bed. Sorry for not replying sooner. I'll get to your avatar tomorrow. I am going to design in the order I get the requests. 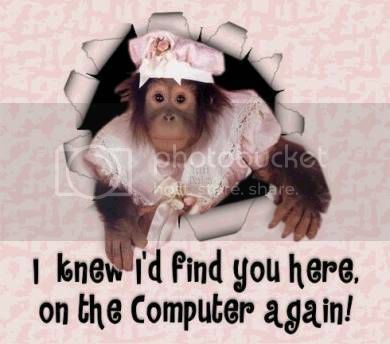 Thank you for posting the monkey photos for other monkeys to use if they want. Thanks for Zoe's patriotic outfits. I will be switching them around, so all of them get shown. Glad you want to use them all! I'll be happy to do something patriotic for you. I do need your original avatar though, without the Easter decorations. Do you have a copy to post here for me? If not, I may be able to find it out on the web. I think CBB did my Easter outfit, so my original isn't shown. I know she has a lot going on right now, so maybe you could give me some patriotic spirit? thanks. I will be happy to design a patriotic outfit for you. Give me a few days and I'll post what I have come up with for you. Brandi, you've done it again. THANKS!!! I LOVE IT!!! Making monkeys happy (and pretty) is what it's all about!!! So glad you are pleased! Rather than using something completely different every time, I wanted to find a monkey that would be easy to work with and stick with it. I found three possibilities and wanted your opinion. I like the top image the best. Also, rather than going straight to 4th of July, I kind of wanted a Memorial Day avi incorporating red poppies. What do you think? I know you're really busy, so I can attempt (ha!) to do something myself. Thanks so much, and all the new avi's are beautiful. I'll probably take your first suggestion to do a "poppy thing" to for Memorial Day for you. Give me a few days and I'll post my creation here for you. Aww.. thank you so much! This is adorable! That was the first design I did for you (I like working with that cat) and saw it and thought, "It's just right the way it is." I am so glad you agree. Thank you so much for the 3 Chihuahua avatars. I love all three, and will change to the tall hat for the 4th. 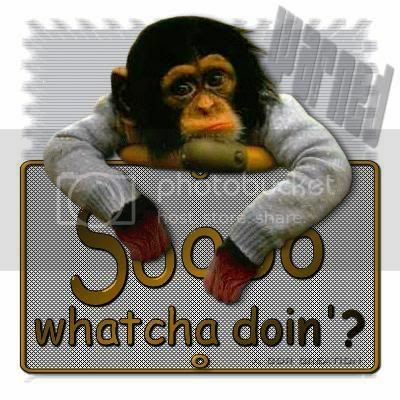 By the way I changed to Chi-Monkey because I did not realize the intensity of WS feelings about SM. I am dedicated to not being banned anywhere! Thanks again. I feel so beautifully dressed and cute to boot. Thanks for letting me know. Glad you like your avatar! I'll see what I can come up with for you in the next day or so. Hi Brandi... I'm very very new here as you can see. My avatar is very dear to me. but it looks naked compared to the others. I am basically a very conservative dresser and don't need much to make me happy. Anything you can do willl be greatly appreciated. I'll be happy to design your avatar. Give me a few days to come up with something special for you! I'll post it here when it is ready! If you don't mind, I am going to work on the avatars in the order in which I receive requests, so it may be a week or so before I am done with yours. Page created in 1.801 seconds with 19 queries.